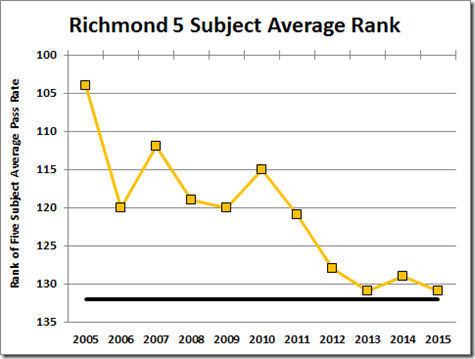 Jim Weigand sent along his analysis of the history of Richmond’s statewide rank among the 132 divisions on his five-subject SOL pass rate average. 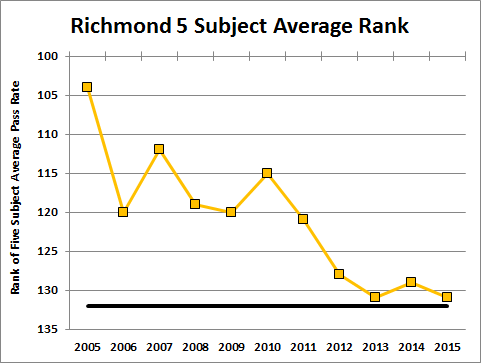 Here are the data. The black line is the lowest possible rank: 132d out of 132 divisions. EXTRA CREDIT QUESTION: An “A” to the reader who can tell me how to get Excel 2010 to reverse the Ordinate, as here, but get the hash marks to go to the bottom, rather than stay at the top, as here.